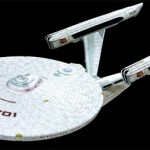 You are currently browsing the Collector Model blog archives for October, 2009. Bob and I really value the input of the behind the scenes designers and craftsmen that had their hands in the creation of some of the best sci-fi out there. We’ve taken the initiative to contact people here and there that we feel would give some good insight into the subjects we are releasing as model kits. We think it is a good way to really give more content to our website to keep people check back once in awhile. 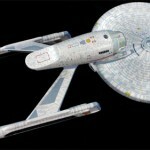 Bob recently interviewed Ryan Church, the designer behind the new movie Enterprise. We’ve also contracted him to do a box cover illustration for the kit when it gets released. Regardless of which side of the fence you fall on in the great debate over the ship, I think the interview does a good job of showing what went into the design and Ryan’s approved concept sketch seemed to capture more of what fans thought was missing. It was my honor recently to interview Andrew Probert. It was kind of difficult for me because I can get star struck at times. I had to buck up and come up with some good questions and not sound like a newb. I’ve been exposed to Star trek my whole life. I knew the characters and the ships but not the names behind the effects and I knew a lot of the readers would probably be more “in the know” than I was. I did a little research by reading a couple other interviews with him and decided to focus on subjects we have coming out. I felt that approach might gain some new insight that modelers would find helpful as they sit down to capture some of the magic of the filming models. Andrew was very gracious and answered everything I threw at him. The interview can be found in the “articles” section of our website. I hope everyone enjoys it. Feel free to comment here to discuss it. A little while after the interview, we came to the realization that the artist we had planned for our new box cover (me) seemed way too busy to get the art done in time. 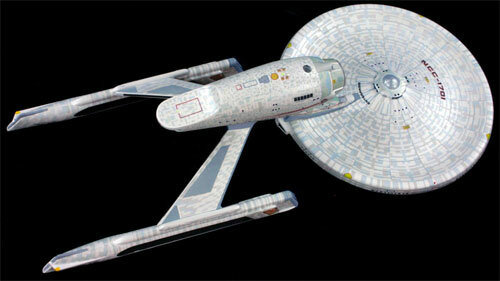 I had really been looking forward to painting the ship but I saw no gap in my schedule to do it in. 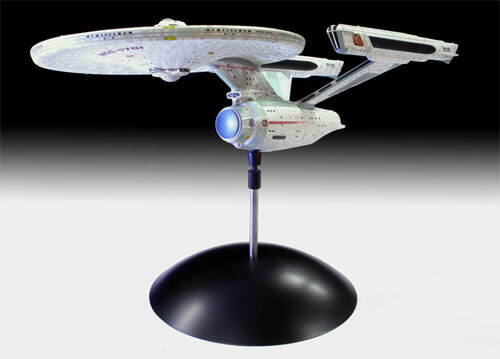 While researching the green-cast strongbacks for our new 1/1000 Enterprise Refit, we were shown a section of an image by Andrew. 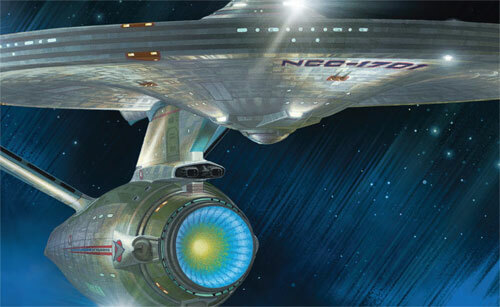 It struck me that the image was a great angle of the ship and as usual was an awesome rendering. 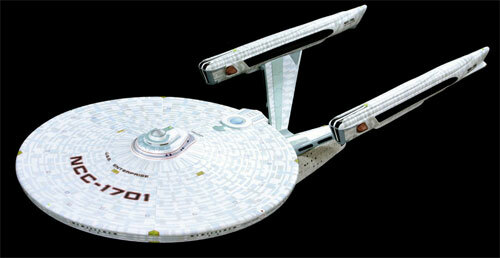 We would just need the ship itself, as the licensor requires us to use a certain background anyway. I offered up the idea to Bob that if I couldn’t find the time, maybe we should see if we could gain the rights to use that as our box art. I’ll tell you that at the time, I was BUSY (heck I’m still just as busy or more so) but I would have made the time (slept less) to paint the ship for the box. Opportunities like that only come along once in several life times. At the time though, I just figured if I couldn’t paint it, having a Probert illustration is actually better for everyone as more people know him than me obviously and I would still get my beauty rest. So we contacted Andrew and we agreed on terms to use the Refit image as seen in his print, “Past Reflections” (which is available on his website). And the crowd went wild while I shed a tear as my opportunity to paint my favorite Enterprise for commercial use passed me by. If I said our workload here at Round 2 is unbelievable right now, that would be an understatement of epic proportions. I barely have time to write this blog entry. I promised myself it would get done last week. Anyway, here it is now. 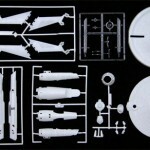 I just have minute to tell you about the Round 2 model kit preview we have going on at iHobby. We will be releasing our plan for the first half of next year. We’ll be bringing out around 50 kits by the middle of 2010. 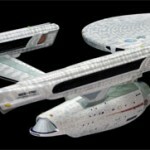 Around 20 kits will be genre (sci-fi/ pop culture) kits. Some have been mentioned in passing before and of course many have not. This just sets us up for a great 2010 with many more high profile releases to come later in the year. We’ll also be releasing our first print catalog showcasing all of our model kit brands. 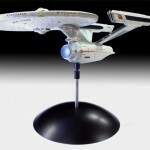 Amidst our display, we will have a built mockup and hopefully a built test shot of our new 1/1000 scale Enterprise Refit. I hope to see everyone come out and take a look. To add to the incentive of just coming out and taking a look, I’ve got something special for a lucky sci-fi modeler- a test shot to take home of the new Refit kit. The only catch is that you have to write a review of it here and everywhere else on the internet that sci-fi models are discussed. So how will I know who to give it to? Just reply to this post. I’ll draw one of the names from the posts. Cut off for sign up will be Friday morning (when I leave for the show- no hard deadline so sign up sooner than later) You must be present to win Sunday at 1:00cst at the show. I’m showing some pics of our finished mockup. It turned out well for being cast in all opaque resin. The decals you see are prototypes and will be tweaked to lighten them considerably. Notice the strongbacks are greenish gray, that’s why we keep calling this one the “Refit”.